Michael Melonakos was born in Monroe, Michigan and graduated from Michigan State University, where he majored in finance and international business and was the president of his fraternity. After graduation, Mike headed down to the University of Georgia for law school, and he’s been in the South ever since. While at UGA Law, Mike served as a notes editor for the Journal of Intellectual Property, was a teacher’s assistant to first-year law students in Contracts, and co-founded the Business Law Society. As a young lawyer, Michael spent several years working for two of Atlanta’s premier insurance defense firms. He represented locally and nationally-known trucking companies, automobile insurers, and premises liability insurers in defense of lawsuits filed by accident victims. When Mike made a career move to the plaintiff’s side, his tenure in the large law firm environment and representation of prominent insurance companies provided Mike the experience necessary to obtain hundreds of favorable settlements and verdicts for his personal injury clients. 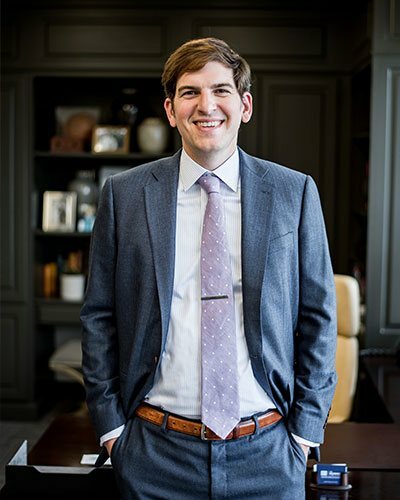 After a decade of practicing law in Atlanta, Michael and his wife Bren decided it was time to move back to Bren’s hometown of Greenville, SC so they could help accident victims in the Upstate area and be a part of a beautiful, growing city. Michael’s experience in Atlanta’s fast-paced environment gives him a big advantage, as he has seen every type of injury and fact pattern and knows how to maximize the value of every case. When not working for his personal injury clients, Michael volunteers for the Greenville Bar Association. He regularly volunteers at his children’s schools and attends St. George Greek Orthodox Cathedral. He enjoys spending time with his family, playing guitar, and playing golf.